Due to heightened alert level 3 of Mayon Volcano. There are 12,000 families expected to be evacuated as volcanic activities worsening. These are families residing at a 6-kilometer permanent danger zone ( pdz ). PDRRMC record shows of 10,000 to 12,000 families are scheduled and subjected to forced evacuation. Such as are from 52 barangays from 6 to 8 kilometers kilometers extended buffer zone. On the other hand, DepEd already prepared for the contingency plan resuming classes that are affected by the volcanic eruption. Earlier, Phivolcs - DOST raised the alert Level 3 for 39 rockfall events recorded. 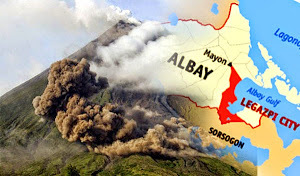 Right now, abnormalities of Mayon causes more ashfall that concerning government. According to Phivolcs , between 5 pm and 8 pm yesterday they tallied 39 rockfall event. Moreover, there were also 32 low frequency volcanic earthquakes that indicate volcanic gas activity . Consequently, Mayon Volcano is under the unified monitoring across the Phivolcs and authorities. Thank you for reading Mt. Mayon, A Perfect Cone Volcano Causes People For Force Evacuation posted on the website Kwentology if you want to redistribute this article please include the link as the source. Have some kuwento to share? Contact us!